Come ride with us to Pushkar, for the world's largest horse and camel fair! Watch Relief Riders International's Give a Goat program at work. Unable to join us on a ride this year? Purchase a cataract surgery or buy a goat for a family in need. Read recent reviews of our Relief Rides on Much Better Adventures. 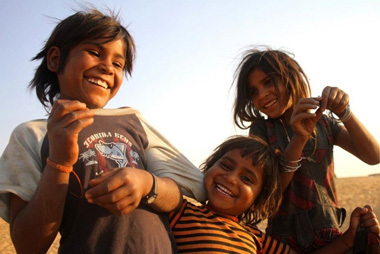 "In my field of travel writing, the description 'life-changing' is bandied about loosely, but I could not be more sincere when I say this trip (February 2007 Nagaur Relief Ride) changed my life." (read more) -- Andrew Mersmann, author of Frommer's "500 Places Where You Can Make a Difference"
DONT KNOW HOW TO RIDE A HORSE? JOIN US ON OUR CAMEL CARAVAN! As we cross into mid-year, we have some exciting news to share with you! 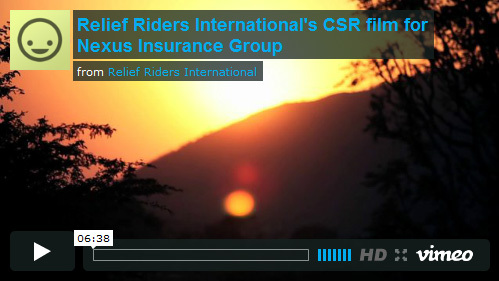 Over the past year, we at Relief Riders International have been hard at work developing our Corporate Social Responsibility Division. The creation of this new division within Relief Riders International is designed to address the growing demand of companies wanting to affect positive change in the world. RRI's Corporate Social Responsibility (CSR) initiatives are designed to provide dynamically efficient and meaningful legacy building or humanitarian solutions through our various humanitarian programs for US and International companies. We're excited to announce our most recent CSR initiative with Nexus Insurance Brokers. Nexus, through Relief Riders International's CSR Division, is launching their "Ten in Ten" campaign, which aims to restore the eyesight of 10,000 people in India over the next 10 years. 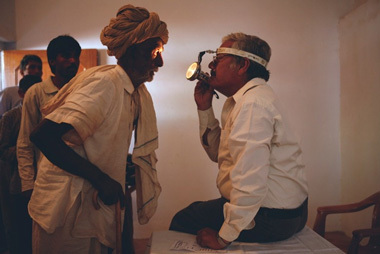 India is listed as having the highest population of blind people in the world, with 15 million citizens already blind and another 3.5 million losing their sight each and every year. The cause of this widespread vision loss: cataracts, which are completely treatable through a simple, 15 minute operation. Through this powerful CSR initiative, RRI will be setting up various free eye camps for Nexus throughout the remote regions of the country where access to quality medical care is scarce. There, we will conduct free vision screenings and provide referrals for those suffering from cataracts to receive free surgery at local hospitals. With the "Ten in Ten" campaign, not only will the sight of thousands of people in need be restored, but they will, as a result, also be given the opportunity to receive an education, seek gainful employment and become contributing and welcomed members of their communities again. We are very excited and heartened by this partnership with Nexus, and we're looking forward to designing and implement similar programs with corporations that have the drive and desire to give back. If you own a business or know of one that may be interested in developing customized legacy or humanitarian solutions which make a positive impact and change lives, please don't hesitate to contact us. We'd love to help you set up your own CSR program so your organization can begin to make a difference! As always, we thank you for your ongoing support and we're looking forward to the amazing things the rest of 2013 will bring!